Previously, NSSPhoenix reported in December 2011 on the new Stratolaunch design for air launched orbital satellite services. Stratolaunch is the brainchild of billionaire philanthropist and Microsoft co-founder Paul Allen. Allen enlisted Scaled Composites from Mojave, California to build the twin boom mothership, pictured above. The 222,000-kilogram airplane with a 117-meter wingspan would be capable of flying 2,400 kilometers before deploying a rocket capable of delivering 2,300 kilograms to geosynchronous orbit. Space Technologies Corporation (SpaceX) agreed to study the feasibility of turning their Falcon 9 rocket into an air-launched system. Dynetics Corp. of Huntsville, Alabama was chosen to build the mating and integration system. Allen, the author of the SpaceShipOne project that won the Ansari X-Prize for two consecutive sub-orbital flights of 100 kilometers within two weeks in 2004, said that he expected to spend “at least an order of magnitude more” on Stratolaunch than he spent on SpaceShipOne. In late November, SpaceX and Stratolaunch parted ways, agreeing that the effort to retool the SpaceX assembly line into one capable of building a four or five engine Falcon with the associated structural and engineering changes, was too great a change to the SpaceX business model in return for the financial possibilities. 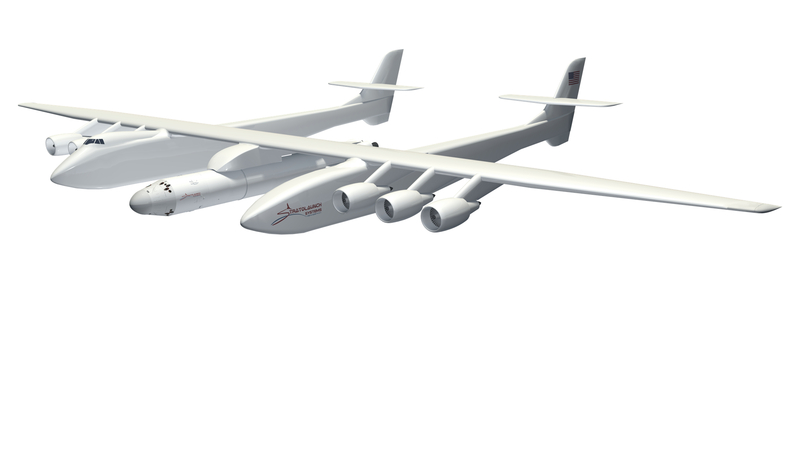 Subsequently, Stratolaunch approached Orbital Sciences, a company with a long history of air launched orbital missions dating back to 1990. Orbital has agreed to study providing the launch vehicle for Stratolaunch. Currently, Orbital’s Pegasus system can put 450 kilograms of satellite into low-Earth orbit. But there has been only a single launch in the past four years, and the only remaining manifest is for a 2013 launch of NASA’s Interface Region Imaging Spectrograph space telescope. Orbital is currently working on their Commercial Resupply Service (CRS) Antares rocket, which relies on a liquid fueled first stage powered by Ukrainian built rocket engines, to fulfill a contract with NASA to resupply the International Space Station (ISS). Stratolaunch has been engaged with Orbital for several months and have contracted with Orbital to evaluate configurations of Orbital systems capable of satisfying Stratolaunch requirements. The National Space Society (NSS) is an independent, educational, grassroots nonprofit organization dedicated to the creation of a spacefaring civilization. Founded as the National Space Institute (1974) and L5 Society (1975), which merged to form NSS in 1987, NSS is widely acknowledged as the preeminent citizen’s voice on space. NSS counts thousands of members and over 50 chapters in the United States and around the world. The society also publishes Ad Astra magazine, an award-winning periodical chronicling the most important developments in space. For US tax purposes, NSS is a tax exempt 501(c)3 educational nonprofit corporation; donations are tax deductible. NSS Principles – What Does NSS Stand For? NSS Beliefs – What Does NSS Support?